I have a bit of an addiction to baking bars. To me, they’re the best of all baking worlds. Seriously, I could dedicate this entire blog to bar recipes. If I were to do that, I might start to bore some of you, so I soldier on with a little more variety. Today, though, we have bars! I happened upon this recipe purely by accident over at Gilt Taste. 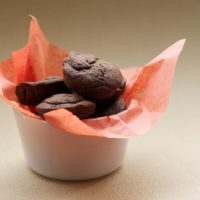 The folks at Momofuku Milk Bar were featured in a series of articles about their favorite family cookie recipes. 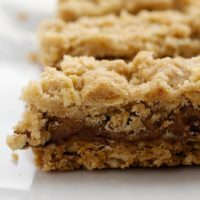 As soon as I saw this recipe for a bar that resembles a cinnamon sugar cookie, I was sold. I very rarely make sugar cookies. I love their brilliant simplicity, but I ultimately skip over them in favor of something else. These bars offered just enough variation and interest to get me hooked. These were simple to make and received a slew of compliments. They are very buttery and soft and just plain delicious. 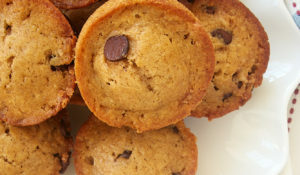 The original recipe indicates that these should be made into bite-size bars, yielding 150 bars. I cut mine a little larger and liked them that way. I still had plenty to share. 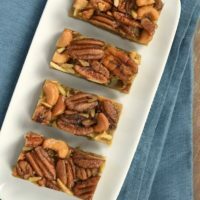 If you’re baking for a crowd, which is not uncommon this time of year, bite-size will definitely give you enough bars to feed a lot of people. 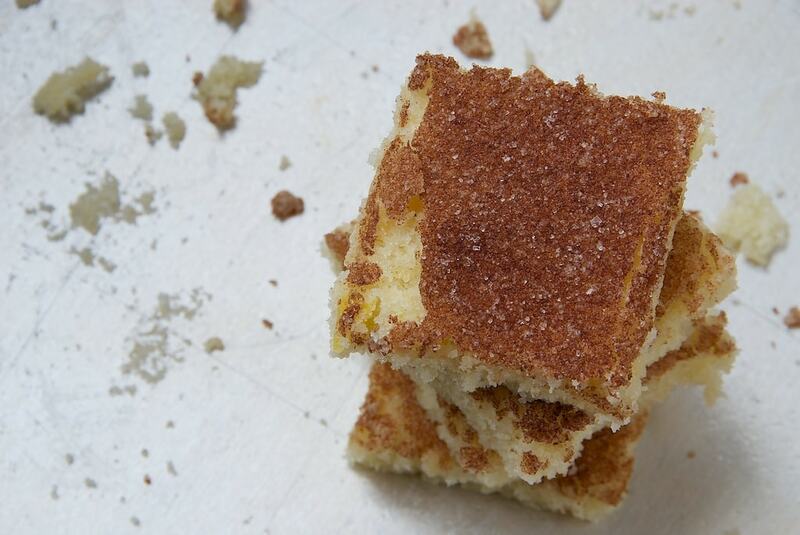 Cinnamon Sugar Cookie Squares are sweet, soft, and flavored with plenty of cinnamon. Great for feeding a crowd! Preheat oven to 350°F. Grease an 11″x 15″ baking pan. Using an electric mixer on medium speed, beat the butter, sugar, oil, eggs, and milk. Mix in the vanilla. Reduce mixer speed to low. Add the flour, salt, and baking soda, and mix well. Pour the batter into the prepared pan. Spread evenly with an off-set spatula or knife. Sprinkle with cinnamon sugar. Bake 20 minutes, or until the edges are light brown. Allow to rest for 10 minutes. Then, cut into squares. 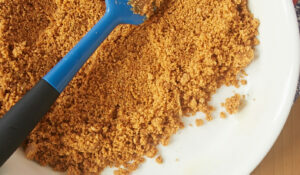 *To make cinnamon sugar, mix 1/2 tablespoon ground cinnamon for every 1/4 cup granulated sugar. Recipe adapted from Momofuku Milk Bar via Gilt Taste. nice. this is a better was to have sugar cookies. way better! 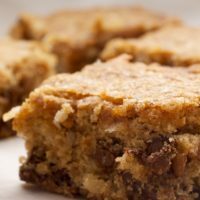 Aside from Momofuku’s compost cookie recipe, which is my favorite thing to bake, I prefer bars simply because they’re so much quicker and more satisfying. Thanks for this recipe! And off to investigate the others! These look great…..I’m a big fan of bar cookies too. Any thoughts on changing the size of the pan? I have only a 9 x 13 pan. If that wouldn’t work, is the suggested pan a “jelly roll pan”? Thanks for any thoughts…..you have a great site! Marianne, if you don’t have an 11″x 17″ pan (which is a normal half sheet pan), then I would suggest making these in two 9″x 9″ pans. Or, half the recipe and use one 9″x 9″ pan. The bars will be a bit thicker, so you may need to bake them a little longer. They look too good to pass up because of a pan. I love bars, too! 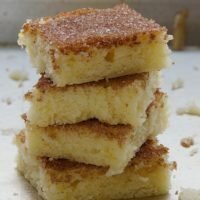 These sugar cookie bars sound delicious, and I love the crispy sugar on top! Definitely going to make these!! This is basically a brioche dough with a little more butter replacing the milk. These are yummy! I made them for my preschooler’s Christmas pageant, and they went over really well. And I had plenty left over to keep at home, so my kids were able to stop complaining that I was giving them all away. Thank you! Those look delicious…like bar snickerdoodles. I love the cinnamon and sugar on top. Going in the file of recipes to try! 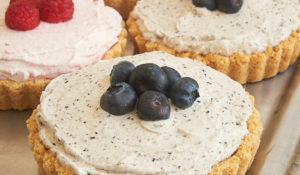 Love the pictures, recipes and enthusiasm of your site! Thanks for the tips, recommendations and ideas! I’ll be a loyal follower! so late to the party with these, but glad I arrived….they are DELICIOUS! So simple to pull together and they get better each day. 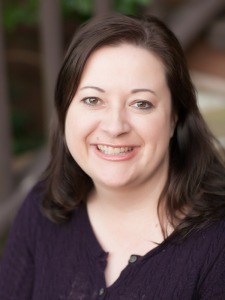 Definitely a keeper…love your blog! I made these a few days ago, and they are great! They make a nice accompaniment to one’s morning coffee, I’ve found (I’ve been telling myself they’re like a little coffee cake, which seems slightly more acceptable than eating cookies for breakfast!). I’m looking forward to trying more of your recipes. Thank you! I know this is an old entry but just gotta say I made these a couple days ago and now I am having to make them again. My boys DEVOURED them. I thought they were great and also will be making them for some upcoming bake sales. Thanks so much! I wanted to know if anyone has made these in a 9 x 13 pyrex dish and if that would come out ok? If so how much cinnamon sugar did you use? Thanks. Hi, Kathy. They’ll be a good bit thicker if you make them in a 9″x 13″ pan. If you don’t want to use an 11″x 15″ pan, then I’d recommend using a 9″-square pan and halving the recipe. Can you tell me how much cinnamon sugar you put on top? I want a nice layer like you showed in your photos. The topping looks amazing. Ch, I didn’t measure it. You’ll just want to cover the top thoroughly and evenly in a thin layer. I am glad you asked this question even though we didn’t get a good answer. I am a very precise baker and would have preferred a better idea 1/4 cup, 1/2 cup ?? of cinnamon sugar. Jennifer I do love your recipes. Thank you. Try starting with 1/4 cup. You can always add more if you prefer. I’ve never frozen these, so I can’t give you a definitive answer. But I think they’d be fine to freeze. I made these tonight and I am freezing right now so maybe I can answer the previous question. Even though on a diet I did have to have a small piece and it was delicious. A sugar cookie in bar form. Nice and soft and the cinnamon sugar adds a nice effect. Also for minimal ingredients produces a lot of these even a good chunk sized. I will make these again!! Sugar cookies are the best! I love the idea of making them in bar form! Great twist on a classic. 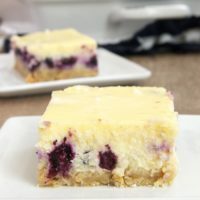 Such a great dessert idea, they look so moist and delicious! Love-Your-Site! Christmas is coming! 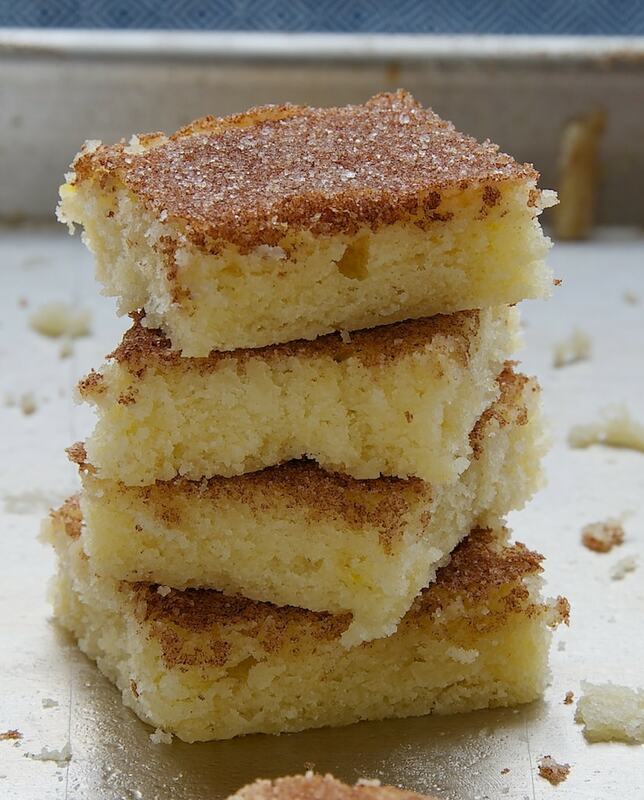 October is the perfect month to try new big crowd recipes and these cinnamon sugar cookie squares are definitely on my dessert list for Christmas 2017. Thanks a bunch Jennifer for sharing the most important part of a meal with us…these are delights! I will most certainly come back for more, you have so many choices here, i’m in dessert heaven! Thanks again for the wonderful work you do here. Hi Jennifer! Thinking about making these this evening! I’m curious though, can I substitute the butter for just another half cup of oil? Equaling the full oil amount to 1 cup? Hi, Nichole. I don’t think you’ll get quite the same result, but you can certainly use that substitution. I believe you’ll need less oil, though. I think the substitution is usually 3/4 the amount of butter. Thank you! I didn’t get to see your reply till just now. I did use the equal amount when I made them and it was a hit! I’m actually baking them again tonight but without any substitutions! Such an easy, hassle free recipe! My son and husband love them… sent some to my mother’s and they were equally loved! I’m glad they’re a hit for you! And thanks for letting me know how that oil substitution worked. I am interested in making these bars for an upcoming church event. I will need to make quite a few so I’ll need to bake in advance. My question is, do they freeze well? Thanks! Hi, Michele. I’ve not tried freezing them, but I would think they would freeze well enough. Hello. 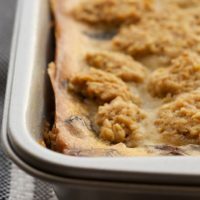 What do you think if I make two batches and bake them in a full sheet pan? Hi, Teresa. I’ve not tried that, as I have a standard oven that won’t hold a full sheet pan. But I would guess it would work fine. The thickness of the bars wouldn’t really change, so I don’t think the baking time would be affected. I baked these in a 9×13 glass pyrex before reading the comments :/ ) and they turned out really good. I did however cook them longer than the 20 minutes. I set the timer for an additional 10 minutes but checked on them after 5. These are definitely a keeper! I’m so glad you liked them, Ceci! Glass pans don’t bake quite the same as a metal pan, so that could account for the timing difference.